This super grain is one of the richest sources of both soluble and insoluble fibre. These dietary fibres provide your colon with friendly bacteria which helps makes your colon a happy camper. Barley’s true claim to fame lies in its high levels of beta glucan, which helps lower cholesterol which in turn lowers your chances of developing heart disease. It also promotes healthy blood sugar levels by slowing down the absorption of glucose, a winning combination for diabetics. It has an official health claim from Health Canada stating that barley can help lower your risk of heart disease. Yes, this Canadian grain is a rock star! Store uncooked barley in a cool dark cupboard or your fridge for up to one year. 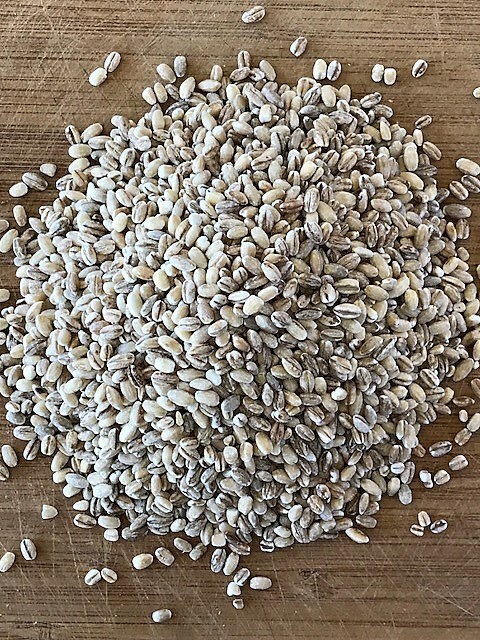 When cooking pot barley as a side dish I use 1 cup (250 mL) of pot barley to 3 cups (750 mL) of liquid (use chicken, veggie, beef broth, or water), bring to the boil, cover, reduce the heat and simmer for 40-50 minutes or until cooked to your doneness level. I like mine a bit chewy so I aim for 40-45 minutes. It should be chewy but not rubbery and not mushy. Stir once or twice to evenly distribute any remaining liquid, remove from heat and let sit covered for 10 minutes. Serve. Or let cool and use instead of rice or beans in a salad. did you develop these for Linda? can you give more hints, was it a breakfast or a snack….